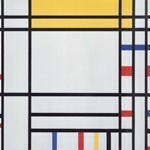 Piet Mondrian (1872-1944) was a Dutch painter who developed an abstract form of art called neoplasticism. 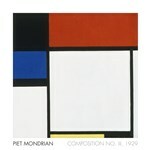 His art was influenced by cubism and was strongly non-representational. 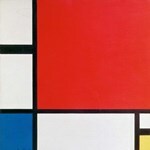 Natural forms were reduced to their abstract essence. 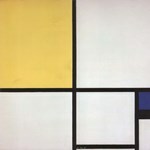 In his compositions, Mondrian limited himself to straight lines of varying width and spacing, primary colours, black and white.The ratio of the "Golden Section" was utilized and mathematical precision was of paramount importance. Image Size: 19" x 20"
Image Size: 5" x 11"
Image Size: 29" x 17"